Dr. Meriem Boumehed is a lecturer working in the area of computer vision as part of the Signals and Images Laboratory in the Department of Electronics at the University of Science & Technology Mohamed Boudiaf in Oran. She is the first author on the paper entitled “Moving Objects Localization by Local Region Based Level Sets: Application on urban Traffic”, published in the Journal of Mathematical Imaging and Vision, and which won the 2014 Algerian Paper of the Year Award in Computer Science & Engineering. Inspire Magazine speaks to Dr. Boumehed about the winning paper as well as other research taken place at her lab. Inspire Magazine: Dr. Boumehed, Thank you for speaking to Inspire Magazine, and many congratulations for winning the 2014 Algerian Paper of the Year Award in Computer Science & Engineering. How do you feel about winning this award? Meriem Boumehed: Thanks for your congratulations and for giving me this opportunity to talk about my work. I would also like to thank you for your idea to create the academic network anasr.org in order to meet Algerian researchers and scientists. I am so glad and feel blessed to win the 2014 Algerian Paper of the Year Award in Computer Science & Engineering. On this occasion, I would like to thank my loving and supportive husband, Dr. Alshaqaqi Belal, who has always supported me in my work, always given me the strength and encouragement to follow my dreams and accomplish my research endeavours. My sincere and deepest appreciation and thanks to my professors Abdelaziz Ouamri and Mokhtar Keche for their informed guidance, support and encouragement. Meriem Boumehed: The main objective of the work reported in the paper is to develop a new approach to detect and automatically locate moving objects (persons, cars, etc.) in video surveillance. We proposed a technique that separates the background from the foreground in a video sequence and then extracts the content of the foreground based on a method called a background-subtraction algorithm. We also used a number of other techniques based on level sets model to localise the detected objects as they moved in space. IM: Can you give us a little more background about this research? Meriem Boumehed: Sure, surveillance cameras are often placed in sensitive security places and they generate a colossal amount of video data. This makes monitoring tasks by human operators infeasible, due to the effect of tiredness and monotony. A lot of research has been carried out to automate surveillance processes to assist human monitors by providing them with relevant information about the supervised scenes. In this context, detection and localisation of objects in motion localisation systems must be accurate. Our own research focuses on the quality of the detection and the localisation, which help, for example, eliminate false alarms that can lead to unwanted consequences. For instance, in traffic surveillance, an over-estimation of the distance of an obstacle can interrupt the traffic. An under-estimation of an obstacle position can lead to an incorrect assessment of the dangerousness of a situation and may cause an accident. Our overall aim is to extend existing research on intelligent surveillance by developing better automatic detection and localisation algorithms. IM: Why is difficult to locate multiple moving objects in a video sequence? Meriem Boumehed: This process is difficult for many reasons. An object may move in an unpredictable way, for instance, a person may walk, run, stop or turn around unexpectedly. The background in a video is also not necessarily always stationary: Static objects such as tree leaves and snowflakes may have repetitive motion, and become part of the detection results, which may lead to errors. So a localisation approach must differentiate between these static objects and the moving objects of interest. This is referred to as the non-stationary background problem. An object may also split into two or more pieces due to poor detection in the current video frame or in previous frames. In addition, two or more objects may bond together to make one object. This may, for example, result from the small distance that separates the two objects and is known as the problem of splitting and merging objects. There are a number of other issues that we have to deal with when localising objects in a video sequence. Objects may disappear or get lost due to noise in the data or poor detection. When an object is lost it should not be confused with other objects. If moving objects become motionless for a while, then they start moving again, they appear as ghosts that are detected in the space where they stopped. Shaded areas, which can be slightly or extremely different from the normal background and move with objects of interest can also be problematic. And finally, If we are detecting objects captured by a moving camera used for surveillance, or if the camera moves because of wind or for other reasons, then everything becomes foreground and we have to account for that too. IM: Your award winning paper describes a method for addressing these difficulties; can you give us a little more details about this method? Meriem Boumehed: We apply a model known as a localized region-based active contour. This model determines objects location by detecting region-based energy, which improves localisation of objects with complex aspects. IM: How is this method different from existing work in the literature and what advantages does it present in comparison to other methods? Meriem Boumehed: The main difference is that the localisation algorithm is based on the the notion of locating objects temporally rather than spatially in order to determine which objects are in a scene, where they are within that scene and what actions they have taken. This way, the method could potentially enable other layers in an application to infer beliefs about those objects. Technically speaking, our approach exploits the Mixture of Gaussians (MoG) to handle the problem of the initial curve placement in the image. In addition, it keeps track of the different forms and shapes of moving objects (persons, cars, etc), and the algorithm stops automatically according to the final form of the moving object. IM: What application areas do you see your findings applied to? MB: Moving objects localisation is a key technology for automation of intelligent systems. This technology can therefore be applied in different areas such as traffic monitoring, video surveillance, gesture recognition, object tagging, and vehicle navigation to name a few. This is because at the core of this technology is the need to not only know whether an object of interest is present, but to also accurately locate its position as it moves within the captured scene. In Algeria, this research can be applied to develop intelligent surveillance systems that can be used for instance in stores, platforms in railway station, airports and so on. IM: What kind of support have you received to accomplish this work? 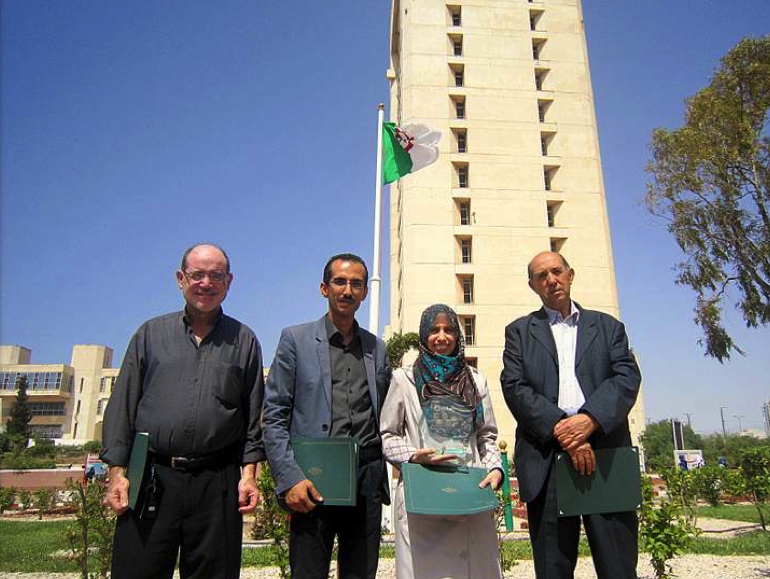 Meriem Boumehed: I had the honour to work within the Laboratory of Signals and Images (LSI) at the University of Science and Technology Oran – Mohamed Boudiaf (USTO-MB) with my advisors Prof. Ouamri, Prof. Keche and my colleague Dr. Alshaqaqi. Our university always tries to encourage research laboratories by providing facilities and support in order to improve the level of their students, scientists, and researchers. My lab is directed by Prof. Ouamri, and supports undergraduate and postgraduate students, including PhD students, and visiting scientists in their research and educational development. The lab always strives to enhance working conditions and provide researchers with the necessary technical and financial support. Honestly, I can say that my lab provides me with all the means I need to successfully accomplish my work. Meriem Boumehed: The research efforts at my lab focus on four fundamental axes, intelligent video surveillance, vision, tracking, and communication. Knowing an object’s position or location accurately can be used in intelligent video surveillance for monitoring for example people and vehicles. Secondly, it can apply in vision to understand the image scene, and interact with objects in the scene; construe geometric relations between objects, and to depict the scene for later synthetic or physical reproduction. Finally, our work relates to visual tracking, which is the process of finding the position of an object of interest in each frame within a time-varying sequence. IM: What is your take on the state of computer vision research in Algeria? Meriem Boumehed: There are several works in the field of computer vision; however, they are still fertile and can benefit from more collaborations between different Algerian universities as well as from collaborations with Algerian researchers who work in this field and who are based outside of Algeria. In fact, researchers outside Algeria can help by, for example, suggesting research projects and supervising Master and PhD theses in order to contribute to the development of this discipline. Meriem Boumehed: My deepest appreciation and thanks to you for interviewing me and for giving me this chance to talk in more details about my research and my lab. I wish you all the best. Congratulations to the winner wa bsahethoum. Wishing them all the best of luck in another amazing work. Great,congratulations Dr.Meriem & best wishes for you in your career.